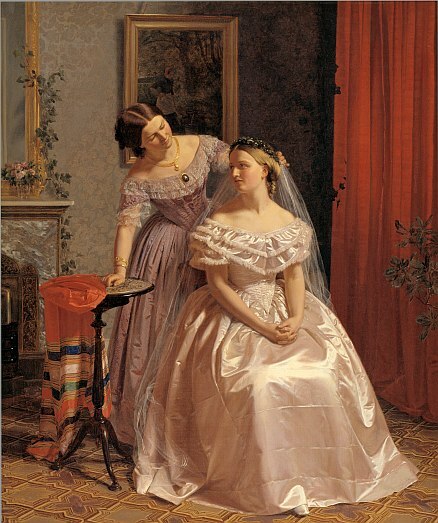 Lovely portrait of a bride and her attendant by the Danish artist Henrik Olrik (1830-1890). The portrait captures that special moment between friends as one young woman nervously awaits her coming marriage and her girl friend makes a last minute adjustment to her veil. Olrik didn’t miss many details – from the designs of the tile floor and floral wallpaper to the gilded frames of two paintings in the background, this painting is simply lovely. It does offer an air of mystery as to who the young bride was and whom she was marrying. Was she a member of the Danish Royal family or was she the daughter of someone important in Denmark’s history? However, not knowing who she was allows us to enjoy the moment for it’s universal nature. To learn more about the artist or see additional examples of his work, please visit our biography of Henrik Olrik.